Nearly 56% of teens and Millennials in Canada use smartphones to listen to music, with a growing number of consumers found to be discovering new music from online and app streaming services operated by AM/FM radio stations. 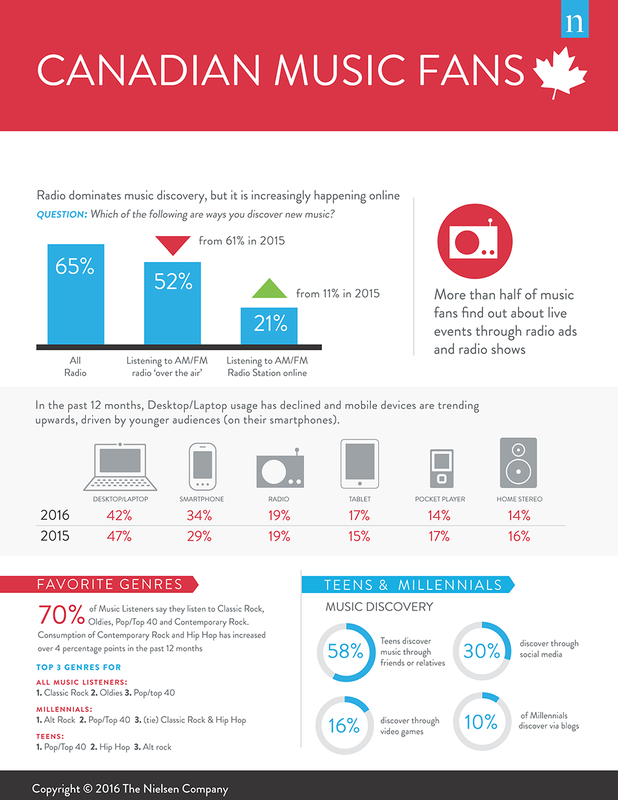 However, OTA AM/FM radio continues to dominate the music discovery process, especially for Millennials, according to a report by Nielsen. For teens though, the top method of discovery is word-of-mouth, as 58% of them discover new music via friends or family. In 2016, 35% of those who are aware of festivals have attended at least one, up from 29% just a year ago, indicating that festival promotional efforts are effective and getting music lovers to turn-out. So what are Canadian music fans actually listening to? More and more, it’s contemporary rock and hip-hop, as these genres have grown their share of listenership by more than 4 percentage points over the past 12 months. The top three music genres for Millennials and teens (in no particular order) include Alternative Rock, Pop/Top 40 and Hip-Hop. Over the past year, their musical preferences are reflected in the popularity of local artists like Drake, Justin Bieber, Alessia Cara, Shawn Mendes and The Weeknd. With the growing popularity of listening on the go, consumers are allocating more of their time using streaming services. Teens spend 37% of their time with music using streaming services. Check out the following infographic showing the latest music trends among the Canadians.